The Mixel iPhone app creates incredible photo collages with grace and ease, as it successfully mixes and edits the best features of popular social networking iOS apps like Instagram, Tumblr, Path, and Pinterest. Wow! The Mixel iPhone app has a fresh, exciting, and superbly edited interface and navigation that raise the bar for the newest wave of social networking iOS apps. You must have a Facebook or Twitter account to get started with the Mixel iPhone app. I synced with Facebook and was pleasantly surprised by the information it pulled. My Facebook profile picture is framed in a circle, like Path. My about me section on my Facebook page became my pithy introduction. I was able to update my location and add my Twitter handle as well. After your profile is established, you can search for friends in Facebook and Twitter, as well as follow folks in Mixel’s iPhone app community. This quick sign-in leads you to the attractive home screen feed of mixels. The navigation of the Mixel iPhone app is similar to Instagram with a bottom menu bar. The feed is most reminiscent of Instagram with a bold mixel photo collage and a synopsis of sharing. When you touch a mixel, the photo collage remains on the screen with the profile photo of the person who created it. The sharing information is also expanded like Tumblr, so you can check out likes and comments. An interesting and unexpected touch is the ability to create a mixel from your own photos to respond to a mixel. The social conversation can expand beyond “cool” and “what is that,” and it can expand into a dialogue between photo collages and interpretations. The sharing feature for each mixel is exciting, as it incorporates an ability to share to Facebook, Twitter, Email, iPhone camera app, Instagram, Pxl, Lo-Mob, Dropbox, Pictwo, and Camera+. The process of creating a photo collage in the Mixel iPhone app is simple and intuitive. You can snap several photos from in-app camera, or you can select from your iPhone libraries, Facebook, and Instagram. The sync is seamless and quickly pulls from your Facebook and Instagram accounts. After you have selected photos or snapped them, you press a check icon and your screen instantly fills with collages with interesting sizes, shapes, and perspectives. You can continue to press shuffle until you find a pattern that suits. You can adjust each photo within the frame using responsive gesture controls like pinching and dragging. Once you have decided you are satisfied with the selection and position of photos, you may adjust the style. The choice of six styles adjusts the effect and framing for your photo collage. For example, the “bento box” style has clean rectangles and squares with rigid lines, or the “oatmeal” style is marked by overlapping ragged edges and muted light. Once the effect is chosen, it is finished and you can add a caption prior to sharing it with the Mixel iPhone app social network. The Mixel iPhone app also shakes up your feeds of friends, popular, and “newbies” by giving them each a special touch and feel to distinguish them and add interest. Your friends feed focuses attention on the dialogue and action around your friends’ collages. 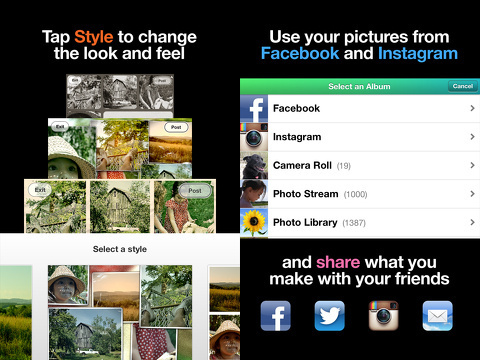 The list format spotlights the social interaction, and the mixel photo collage takes a smaller visual role. With one touch, you can sort to the popular photo collages presented in a matrix grid similar to the newly updated Pinterest iPhone app feed. The Newbies thread has the name of the newbie, then their collage for you to interact. Each of these feeds, including the home screen feed, are unique, yet share a common visual thread to tie them together. The Mixel iPhone app is fun, attractive, smart, and a refreshing change and perspective for social networking iPhone apps. The photo collages are gorgeous, and the special touches to enhance the artistic dialogue, sharing features, and nicely-crafted interface make it a steal for its free price tag. 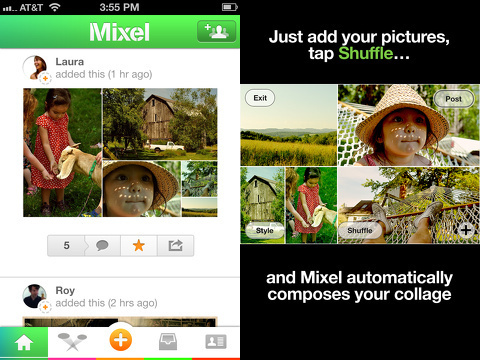 In fact, after you use it, you may want to pay for the Mixel iPhone app social network. AppSafari review of Mixel for iPhone was written by Jenni Ward on August 29th, 2012 and categorized under App Store, Free, Photos, Social. Page viewed 3482 times, 1 so far today. Need help on using these apps? Please read the Help Page.